Below are the official 2017 Hockomock League Boys Cross Country All Stars, selected by the coaches in the league. Canton, 5 vs. Seekonk, 1 – Final – Canton senior Andrea McNeil scored a pair of goals, including one shortly before halftime, to lead the Bulldogs to a win. McNeil scored in the final minute of the first halftime, and the Bulldogs added one more in the final seconds to take a 4-0 lead at the break. Oliver Ames, 164 @ Foxboro, 177 – Final – Oliver Ames’ Nolan Donze carded a team-low round of 39 to lead the Tigers to a win on the road. Milford, 172 @ North Attleboro, 145 – Final – North Attleboro’s Dylan Kane led the way with a medalist round of 33 (two-under-par) to lead the Rocketeers to a division win. Jillian Barend carded a round of 36 while Colby Cameron, Marcus Costa and Aidan Weir each shot 38 for Big Red. Milford’s Zach Tammaro led the Hawks with a 42. Sharon, 173 @ Canton, 139 – Final – Canton’s Jack Goyetch fired a career-best 1-under-par round of 33 to lead the Bulldogs to a win over Sharon. Danny Powers shot an even-par round of 34 while Chris Lavoie (35) and Joey Vaughan (37) both had strong rounds as well. Mansfield, 17 @ King Philip, 46 – Final – Mansfield took the first three spots and seven of the top eight finishes, bouncing back from its first dual meet loss in 15 years. Patrick Heavey (16:10) won the race with Kalin Petrov coming in second with the same time. King Philip’s Mike Norberg finished fourth overall at 16:33. Cullen Lancaster, Paxton Howard, Ben Thibeault and Collin Rice finished fifth through eighth. 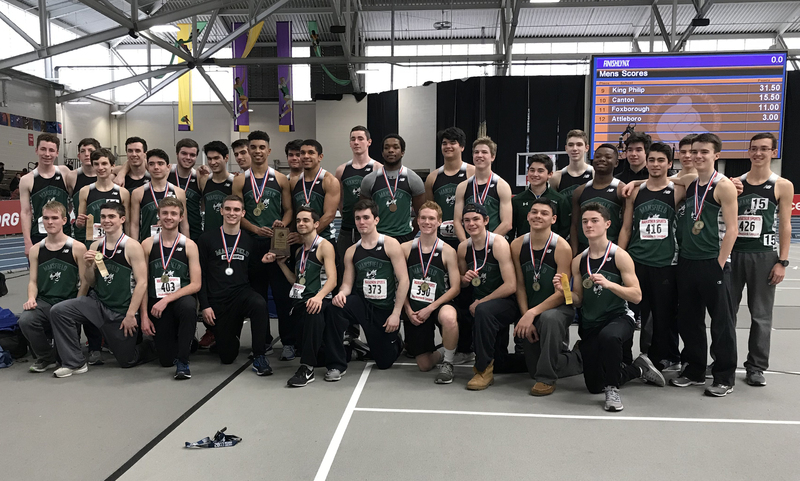 One annual sign that the new school year is upon us is the Massachusetts State Track Coaches Association releasing its preseason poll for the upcoming cross country season. This year, three Hockomock teams are ranked. 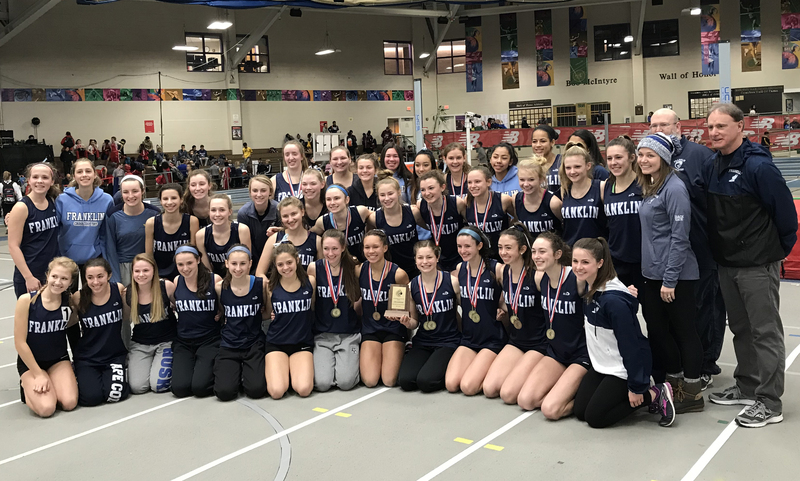 Both the Franklin and Sharon girls squad are inside the top 20 in the Girls Large School Poll while the Mansfield boys team placed inside the top 10 in the Boys Large School rankings. Mansfield is ranked seventh in the poll and the Hornets are the favorites to take home the Kelley-Rex division title. The Hornets have dominated the cross country courses for the past decade and a half – winning every single Kelley-Rex title since the league split in 2010 and having won a league title for every year dating back to 2003. Junior Patrick Heavey is one of the top runners back for the Hornets after finishing second at the league championships a year ago. Seniors Kevin Crawford and Collin Rice had top 20 finishes at Hocks a year ago as well. On the girls side, Franklin comes in at 14th while Sharon is ranked 19th. 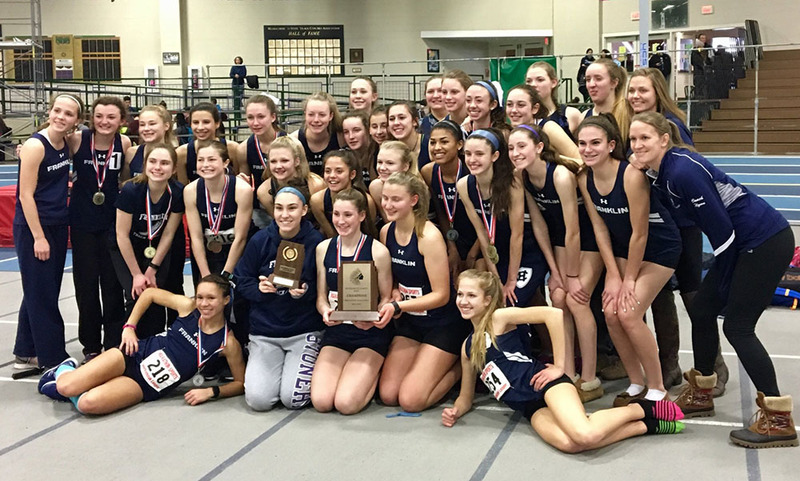 The Panthers won back-to-back division titles in 2015 and 2016, and with defending Hockomock League MVP Nicole Clermont and classmate Katherine Hartnett (first and second respectively at Hock championships) back for their senior seasons, Franklin is in a good position to go for the three-peat. Ella Gutkowski also finished in the top 20, giving Franklin a trio of top runners in the league. Sharon senior Ariadne Tolay was a top 10 finisher at Hocks a year ago and will look to lead the Eagles back to a division title. Sharon won the Davenport in 2015 but North Attleboro claimed the title a year ago. Senior Maria Gieg, a Hockomock League All Star, crossed the line 11th overall at Hocks last year and will give the Eagles a solid 1-2 punch. The Hockomock League will kick off its cross country season with a jamboree on September 5th at Borderland State Park. Below are the official 2016 Hockomock League Boys Cross Country All Stars, selected by the coaches in the league. Oliver Ames, 148 @ North Attleboro, 160 – Final – Oliver Ames had three golfers shoot under 40 on the day as the Tigers improved to 15-0. Brady Allbritton, Nick Lombardi and Thomas Walsh shared match medalist honors, shooting 36 while Ryan McGarry carded a 40. Robbie Congdon shot a 38 and David Colasanti shot a 39 to lead North Attleboro. Franklin, 174 @ King Philip, 158 – Final – King Philip’s Sebastian Ladoulis was the medalist, carding a low-round of 37 to lead the Warriors. Sharon, 235 @ Taunton, 238 – Final – Taunton’s Mike Volkmann was the match medalist, shooting a 42 to lead the Tigers. Stoughton, 187 @ Attleboro, 173 – Final – Attleboro’s Corey McKenna earned match medalist honors, carding a low round of 40 to lead the Bombariders. Taron Mills shot a 43 and Brian Houle and Ethan Johnson each shot 45 for Big Blue. Brendan Campbell led Stoughton with a round of 45. Mansfield, 19 @ Oliver Ames, 39 – Final – Mansfield had four of the top five finishers to clinch their 13th straight league title outright. 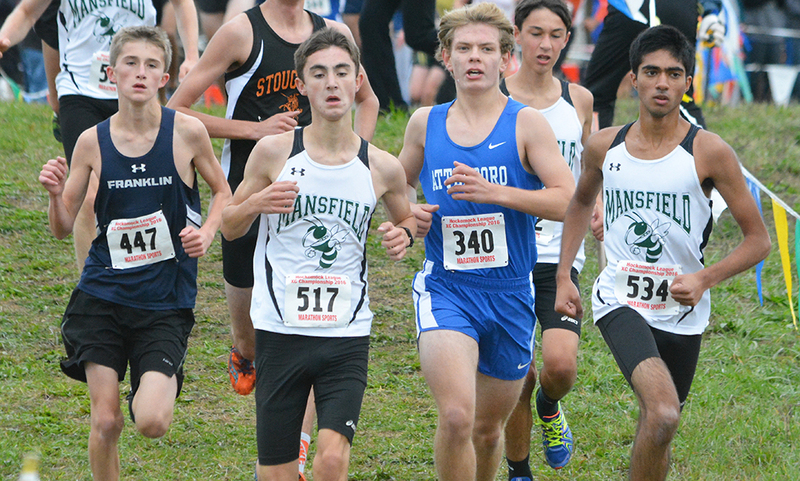 Mansfield’s Kalin Petrov won the race in a personal best time of 16:34 while Nick Rispoli was second in 17:07. Oliver Ames’ Brent Schwartz was fourth in 17:14 with Mansfield’s Patrick Heavey coming in fourth in 17:23 and Collin Rice coming in fifth in 17:36. King Philip, 38 @ Franklin, 21 – Final – For the second straight season, Franklin claimed the Kelley-Rex division title. Nicole Clermont finished first over all to pace Franklin, winning in 19:46. Katherine Hartnett was second overall in 20:02, Ella Gutkowski was fifth in 21:48, Katrina Walbert was sixth in 21:51 and Brianna Cummings finished seventh to round off Franklin’s top five.